Supporters listen as Democratic presidential candidate Hillary Clinton speaks during a campaign rally at Sacramento City College on June 5, 2016 in Sacramento, Calif. Eight years ago this Tuesday, Hillary Clinton conceded the Democratic nomination to Barack Obama, noting in the most explicit terms of her campaign how history might view her first White House run through a prism of gender. Exactly eight years to the day from that speech, Clinton is all but assured to become the presumptive Democratic nominee. Time, Clinton’s ubiquitousness in the political consciousness, the historic nature of Barack Obama’s presidency and her own damagingly high negative ratings have all dampened the drama of Clinton’s crowning as the first female nominee of a major party. And of course, other women have preceded her on the national ticket, namely 2008 GOP vice presidential pick Sarah Palin and Mondale running mate Geraldine Ferraro in 1984. But it’s worth a look back at the historical record to note how much the national mood about women in politics has evolved in the last seven decades or so. It’s true that, in recent years, Americans have mostly shrugged at the idea of electing a female president. In 2015, an NBC/WSJ poll showed that a combined 85 percent said they would be either enthusiastic (30 percent) or comfortable (55 percent) with a woman in the White House. Both men and women reported equal overall positive impressions of a woman as commander-in-chief, and more than three-quarters of seniors and socially conservative voters signed off on the idea. As long ago as 15 years prior, an overwhelming 87 percent of voters said they would have no qualms voting for a qualified female nominee of their own party, according to a June 2000 NBC/WSJ poll. A combined 13 percent said they either wouldn’t vote for her (7 percent) or weren’t sure or said it would depend on other factors (6 percent). 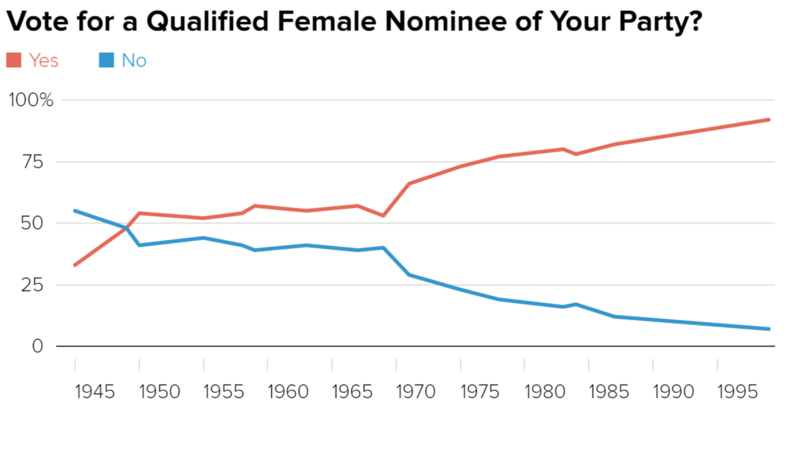 But a few decades earlier, the acceptability of a female candidate was more controversial. According to Gallup’s polling of the issue, in 1975, 73 percent of voters said they would support a female nominee of their own party, compared to almost a quarter - 23 percent - who said they would not. In 1969, it was 53 percent to 40 percent. And in 1945, those who said they would NOT vote for a female candidate outnumbered those who said they would, 55 percent to 33 percent. Here’s how the breakdown evolved from 1945 to 2000, per Gallup. Despite the increasing acceptability of a female president, at least according to polls, activists on both sides of the aisle note that women still make up less than a quarter of elected officials at nearly all levels of government. 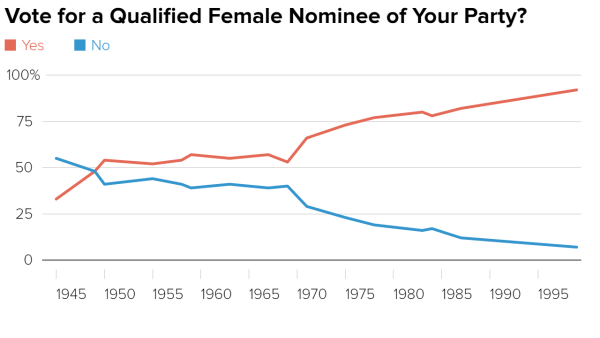 The dearth of female representation in elected office has been well documented by the Center for American Women and Politics at Rutgers University. According to the Center’s data, women make up just 19.3 percent of members of the U.S. House, 20 percent of the Senate, 24.4 percent of statewide elected officials and 24.6 percent of state legislative seats.